It was like one of my dreams came true when I reached the University of East London. 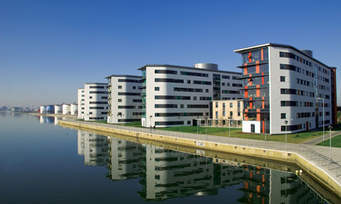 A beautiful and very high tech campus which is located on the back water of Thames River. When we reached the campus on June 2, 2014 at 09.13 am, we were welcomed by our mentor Gurdish Sandhu and and the coordinator, Kulvinder Kalsey, at the entrance of the Library. This fellowship is the most prestigious in Library and Information Science. Our mentor briefed us about the program. We had a detailed discussion about the program at the the state-of-the-art Sports Doc. followed by high tea. Then we returned to library and were introduced with library professionals working with different sections of library @ UEL Library. Lunch was hosted by our Mentor at Pizza Hut, which is just outside of the university. After lunch we were taken to Library tour and introduced to different units of library and staff. This library tour was conducted by Cath Johnson (Library Manager), along with Kulvender. 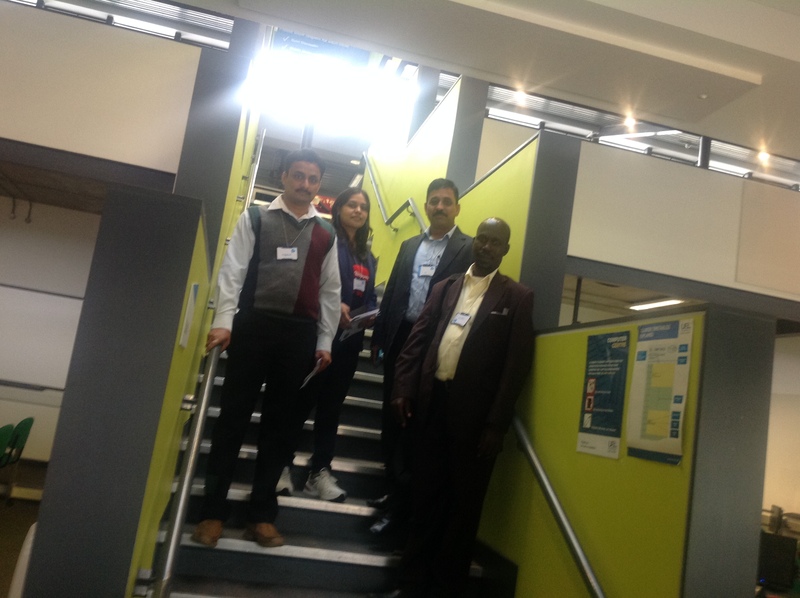 Library tour further made us familiar to the working environment and made us feel as a part of library system of UEL. That’s how our first day of fellowship training got over at 5.00 pm. An induction programme on ECDL was conducted by Kulvinder and we were registered for ECDL. Staff desk along with the dedicated desktop was also provided with secured Id and password. It was made very clear that we have to clear all the seven modules of ECDL i.e. IT Security, Window XP, Excel, Access, Power point & Internet Explorer. and we were happy that this training programme is very structured and useful. During this period some paper work was also completed. After lunch, Gurdish had a very informative and interactive session in staff room of IT block of university and gave us guidance for next days. After meeting again we had a self-practice on first module of ECDL till 6 pm. 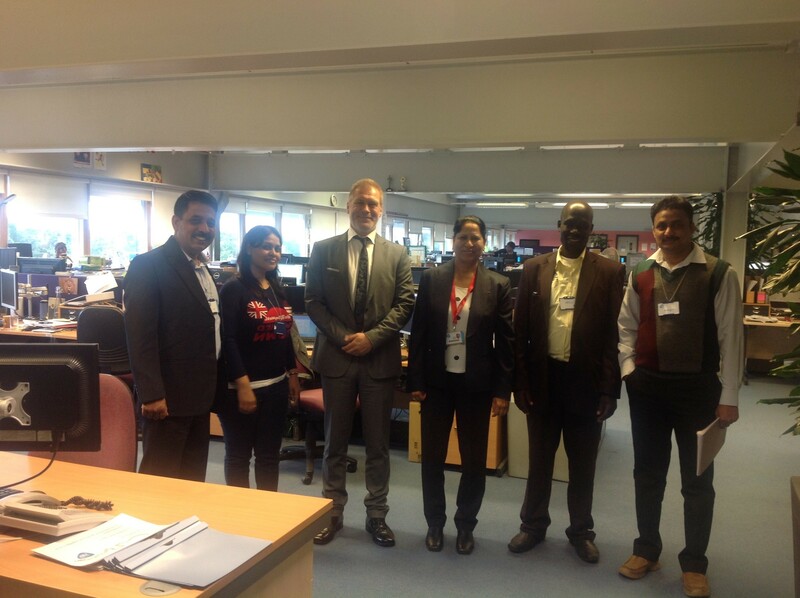 Day started with self-practice on first module of ECDL then at 11 am our meeting was arranged with Mr. Andy Cook, CIO of UEL, an amazing personality. We met him in his office for almost 20 minutes with Gurdish. After meeting again we had a practice on ECDL and appeared for mock test. It was a different and unique- experience because after almost 18 years, I was appearing in any exam. At 1.30 pm started for Stratford Campus of UEL, with Gurdish. Beautiful library and the new thing we saw there, was book sorter. I heard a lot about the book sorter unit but never seen it. It was my first experience with this unit and I really learnt about how it works. Thanks to Gurdish. From the library, we went to computer center of UEL Stratford campus. It was also very well equipped. This day started with very thought provoking session of Mr. John at 10.00 am. He gave us a wonderful presentation on ALMA, a product of ExLibris. EUL is the second library in the world which has procured this library management software. This software contains all features and characteristics of any best software. In my 18 years of professional career, I got opportunity to work on many good software but never seen software like this. John is having very strong command on this software, so it made us more easy to understand. It was really wonderful experience for all of us and specially, the way Mr. John delivered. Thanks John. Whole day we have practiced ECDL and worked on the blog. At 2.00 pm there was a meeting with Gurdish at Sports Doc. She gave a very fruitful presentation on library management in EUL. After this meeting, again we came to library, appeared for first main module test of ECDL and cleared it. Reached EUL early and started self practice on EDCL followed by Mock- Test and after lunch appeared for final exam of module-two, and cleared with scoring 78% marks. After that started practice of module: Seven till 7 pm. Visit to Senate House Library and Central Library of SOAS (School of Oriental and African Studies), which come under University of London, was arranged on June 10, 2014. At 9.30 am we all reached to Upton Park Railway Station, along with with the Kulvinder we have started our journey and got down at HolBorn and had a walk to Senate House library. This seventeen floor, listed huge and antic building library is a central library of London University. Mura Ghose welcomed and briefed about the Library, later she took us on a Library tour. Thanks to Mura for such a informative and interactive visit inputs. After senate Library visit we had lunch at Russel park. Then went to visit British Museum. At 2:00 we reached he SOAS Library and on the reception we were welcomed by Ms. Barbara Spina (Head, Teaching and research support-library) and two of her subject librarians Ms. Helen Porter and Dawan Wright followed by informal interaction on coffee table. Being a research library, it is being used by a huge no of scholars and researchers. After long time I saw a good number of reader in the library reading room. During the interaction, Ms. Barbara explained us all about best practices and other management features of SOAS Library. Then we went on a tour of library. By 4.30 we were free from there and then went to Piccadilly Circus, London. After collecting regular staff identity card, we started working with ECDL and appeared for mock test in first half. In second half there was a presentation of VC’s “Vision and Strategy” in EB2.44 at 3 pm. In one hour session Vice-Chancellor has presented his long term vision and strategy for UEL. After the session again we had a practice on ECDL and finally appeared for final exam of Module -7 and cleared it. Today, schedule of first half was very busy and we all got the opportunity to closely understand the work culture of different desks of UEL Library. First we have been introduced to the circulation practices at counter in RFID environment with the help of Simone. It is one of the unique feature of UEL library. Next interaction was with Anca Zaahn, who explained in detail about the IT related support of UEL library. EUL Library has very rich and unique archive canter. This centre is on the ground floor of library and is being managed by Paul V. Dudman. The main attraction of this archive is Refugee Archives, British Olympic Association (BOA) Archive, East London Peoples Archive ect. It was very good and learning experience for me and the intrusting part was that initiative of this archive was taken by the head of UEL Library- Gurdish Sandhu. Thanks to Simon, Anca and Paul for their valuable time. In second half, again on self practice of ECDL: module -3…. Last working day of second week.. Today session on “Introduction to Acquisition ” was planned at 9.30 am to 1.00 pm. It was very interactive session and we learned many new things. Especially new terms and new ideas of acquisition like Purchase Driven Acquisition- e-books, Demand Driven Acquisition-e-journals, acquisition of open access scholarly resources ect. And the user satisfaction lavel for digital library is above 90%. Amazing…..Thanks to Ewa Cepuchowicz, (Technical Services Co-ordinator) and Lai-Ki Lok (Assistant Librarian: Metadata and Resource Discovery). Librarian at Birla Institute of Management Technology, Greater Noida. Presently at University of East London for three months Commonwealth Professional Fellowship Programe..